Does "center" always mean "half"? I'm spending the next couple months trying out some new non-dance, moving- and body-scale math lessons for my new book. There's an activity in Mathematics Their Way (from the '70s) that I want to try out. The lesson is ostensibly about using your whole, moving body to find the "middle" or the "center" of a space that you can't fold. I was thinking I'd start my version of the lesson by asking first and second graders "What is half?" I planned to give them a piece of 8 1/2" x 11" paper and see what they come up with. Except, as I was getting the materials ready today I noticed some paper cut into big triangles. I took one up to my 10yo who was doing her homework. I asked her to fold it in half. This is what she did. Then I asked her to fold it into half again. 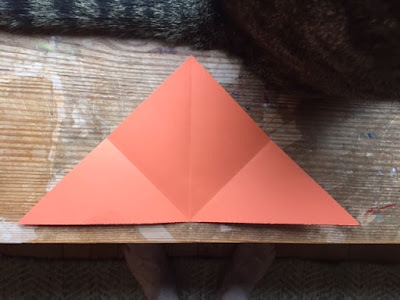 The image below illustrates what she was doing for a split second before she said..."ah...no..."
At which point she said, "I can't fold it into half that way. But I can fold it into fourths." I tried to get her to tell me how she knew when she had folded it in half, but she wasn't interested in talking. 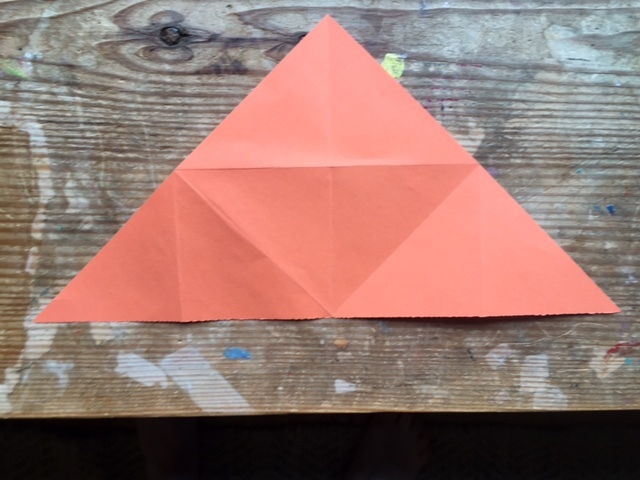 But it did make me wonder how I might fold this triangle into eighths. Then I thought: Wait a minute! We've folded this triangle into eight one-eighths and still haven't found its center/middle. Or, well, maybe we did on the first fold ... but maybe there's another center we haven't yet found? I love it when what I think I know is challenged. We need to do this for our students on a regular basis. And, I'm rethinking my lesson for tomorrow. 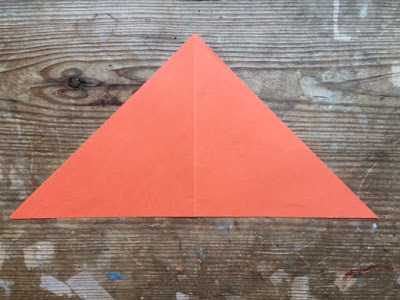 I'll focus on the language of "middle" or "center" and use rectangular and triangular paper. But "half"? Half I'll save for another time. Today's work was to make a four-beat Pattern A. I structure each day/"lesson" as an activity progression with planned pauses to discuss certain key points of the math/dance making. Today I recorded two similar moments, in two different classes, in the process of making Pattern A. When I transcribed the conversations this afternoon what struck me was how differently they unfolded. LESSON SUMMARY: My goal on the second day of my residency is to end the class with every team having a Pattern A they can dance the same way with their partner. We do this by watching individual teams demonstrate their patterns and then talking about what we see/notice about the pattern. This ideally means talking about the pattern properties that reside within the three different categories that build our patterns (movement, foot position and direction). Yesterday's notices made me think that the categories made sense to most kids. At the beginning of each class today we reviewed "what do we use to make our patterns" but when we started looking at the Pattern As I realized that though both groups were making nice patterns, both groups still didn't quite "get" what they were looking at in others' work. NOTE: In the two stories below my words are italicized, and the kids' responses are bolded. In both conversations many children contributed, I just haven't specifically noted change of speaker here. Let’s say what we noticed about that pattern (that the demo team just danced). Kid:They’re both doing the same thing and they’re not off beat. Okay, so by “same” do you mean same tempo? Did you mean same in any other way? (To class): [First kid] was seeing same in the tempo, the same speed. What else did you notice about their pattern? Let’s watch it again. That they’ve got a really good rhythm, like how they do it. So we’ve talked about the tempo. What else did you notice? That they were doing it together they weren’t like one person wasn’t doing different things they were all together. Okay, so “all together” What does it mean? People were saying they were dancing together. So what does it mean to be "all together"? What words will help us describe a pattern that is "all together"? What kinds of things can we identify? [Kids start picking words kinda randomly from our word board] Ooh! Symmetry. Interesting. But what have we been talking about how the patterns have been made? What kinds of things are we using to build our patterns that we could also use to say if a pattern was being danced the same or not? You know, I've been spending most of my time when I’m up at the front of the classroom, near these posters. This is the information that I’d like you to think about. What kind of words on these posters might help you describe these patterns? [Long pause] Movements? Yeah! [talking to the demo team] Did you guys do mostly jumps? Were the jumps the same on every beat.? [bringing the demo team back up to the ] Let’s say jump for each beat while they dance…Now there was another movement in there. Look up at the list. The category of movement has a lot of movement words. Turn? Turn! Right, let’s say jump, jump, jump, jump/turn. And how far did they turn? If they went from front to back? 180! Now, let’s look at their foot positions. Let’s do it slowly. We can also describe the sameness of their dance by looking at their foot positions. Right now they’re together. Do the first beat and stop. Is that split, together, right, left or cross? Split. So let’s see their second beat. Ready, go. What are their feet doing now? Split. Where’s their third beat? Split. Good! You’re staying in this category of foot position…And where’s the fourth beat? Split! Did they do 4 splits? My goodness. Let’s watch this pattern one more time and let’s talk about their direction. So their beat zero is where? Center. So first beat the direction is what? Diagonal. Thank you! Is it a right diagonal or a left diagonal do you think? Right. Now let’s look at the next direction. They went to the…side. The right side! And now the third direction? It looks like they went to a different kind of side with their feet to the right and left. Give them a round of applause! So what I’d like you to do right now is go back to your work with your partner and we need to make sure that everyone has the same pattern as their partner. You’re working together. So what do you notice about this pattern? Let’s watch it one more time and see if you can come up with some words that can help us understand what you see in the pattern. What did you notice about that? [inaudible] So you noticed a type of foot position which was…a cross. Okay let’s watch again and notice other foot positions. Tell me more about what you noticed? They really liked corners. (giggles from all the kids) What else could we be noticing? Okay before we watch this tell me what else we could be noticing? We noticed their starting position, we noticed that their feet were crossed at one point. What else could we notice? Feet? Their left. Well, my right. So right now we’ve been talking about feet? What other CATEGORY could we notice while they’re moving? 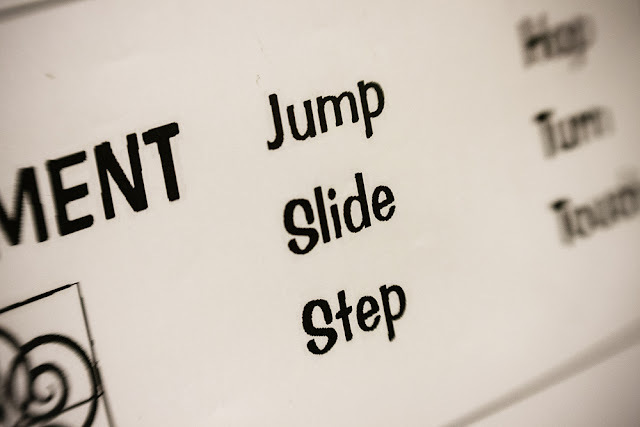 Step? They stepped backward? Yeah, but which category is that? Movement? Well , what category does cross belong to? Feet. While we’re looking at the pattern let’s find words that describe what it is we’re seeing? They start with feet together. Where are they? Center center. We don’t say cross because we’re only looking at one category at a time. But this is challenging, I know that. So let’s say those movement words again. Step step jump jump. Now let’s look at directions. They start in center and let’s do the first beat and stop. The first beat is where? Back left corner. Where’s the second beat? Back right corner. And where’s the third beat? Center. Me trying to talk over them: front, front…just front. Front corners. Well, if they’re in both corners we’ll just say they’re at the front. And what would be the foot position word that would describe the fact that their feet are in both corners? Split. So can you see how all three of those would…(to dancers) show us what your feet would look like if they were together in front. So we would call that a together front. Now show us a split back…and a together back. Do you see how that works? You need more than one piece of information to describe any one beat. ...feel like I had more feedback about student thinking than ever before. I've always seen how children think with their bodies, but was never happy with their written reflections, which didn't really reflect what I saw them do while they were making their patterns. I have also not been happy with how hard it's been to help kids use and apply the terminology of the Movement Variables. I found Notice & Wonder to be a great tool at pulling the language forward in a way that was natural and meaningful for the students themselves. ...noticed that each of my three classes last week moved from general noticings to much more specific noticings as the week progressed. Not only that, but they noticed more and more, and in great detail their own making process and the process of reflection; the math/dance pattern properties and structure (movement, direction and foot position); the differences between a reflected pattern and a non reflected pattern; and the process of unitizing two patterns into one larger one. ...finally felt like students owned everything about the week -- their actions and the language they used to describe their own and others' patterns. ...was grateful for the classroom teachers who made the decision to support the residency by making their normal math time a chance to explore the math we were using in the math/dance making. This was particularly important in terms of the angles/rotations and the idea of congruence. This week I'm back at the same school with three more 4th grade classes. Their Notices & Wonders today were really nice but, like last week, fairly general. I'm excited to see if they follow the same course as last week's students in becoming more and more specific, precise and descriptive with their noticings and pattern analysis. I noticed all the different words you can use. I noticed all the movements, feet and directions we did today. I noticed you can combine different movements. I noticed we were doing the same pattern over and over again and I think we should choose something different. I noticed dance isn't just movement; it's feet, movement AND direction. I wonder what our pattern is going to be? I wonder if I'll have better ideas tomorrow. Today was the last day of the five-day residency with three classes of 4th graders. 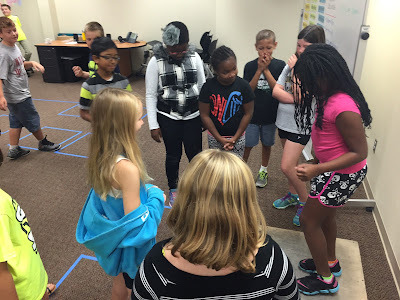 The first four days I experimented with Notice & Wonder. Today we had to finalize 8-beat patterns and had some reflection games to play to end the week. So, we were busy, and I felt that I would probably see interesting things in their final reflections in their residency journals. I decided to make sure that I followed up on yesterday's reflection lesson. And, instead of ending the final class with N&W we ended by dancing our dance patterns to music! Kid 1: That your feet are doing the opposite. 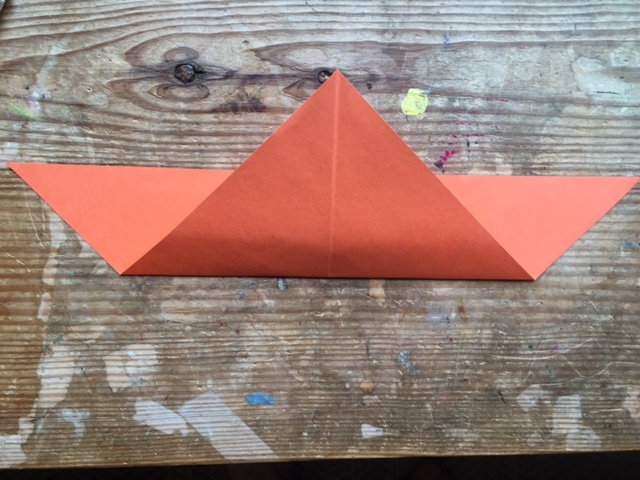 Kid 2: It has to be congruent. Well, it doesn't have to be the exact same but it has to be very similar. Me: So what is the thing that is different about the reflection when they do the dance? Kid 3: If the reflection does its right, the other person has to do its left. Me: So who is the reflection reacting to? Themselves or the original? Kid 4: ...is on the inside. Me: Hmmm. Why don't you guys stand up so we can watch this. So let's say that you're the original. Put your foot in the outside (away from the line) upper right corner. So the reflection puts his foot where? Me: So what else needs to be different? Is it just feet? Raise your hand and tell me what else it could be. Kid 5: Um, your like, body movement? Kid 5: Like, so, say, this person twists this way (gesturing to the right) and the reflection turns to the left. Me: Is there anything else that needs to be different? Me: And the body is involved because it's turned...how far? How far has it been turned from front? Me: Who wants to play "Reflected or NOT Reflected?!" Mr C & 4th grader dance, when they finish there are audible gasps from the audience, like they've figured it out! Okay...let's watch AGAIN! Was it reflected or not reflected? Kid: It was reflected because when they turned their backs were facing each other. Me: So if they're backs are facing each other, that has to mean what? Kids: They're facing in the opposite direction. Me: So, what was their intention, even though they didn't do it exactly the way they wanted, what was it? Kid: She was reflecting because when she was diagonal, she did a right diagonal and the other person did a left diagonal. Me: Was there anything else that you saw that told you it was a reflection? Another kid: Um, the steps they were using when they stepped. So when C. stepped to the right, G. stepped to the left. Me: Why did you not think it was reflected. Kid: Because when they did a right diagonal, the other person did a right diagonal. Me: What other evidence did you have to support your claim that it was not reflected? Another kid: When they turned they turned the same way. Me: Do you have a reason for why it was not reflected? Kid: Because they were going the same way and when they, like, moved their feet together they did the same crosses. Me: Oh, okay. So by "same cross" what makes the cross the same? Kid: They used the same legs. Me: Oooh. Surprise ending! What did you see? Kid: When they, like, turned, they landed in the same place. Me: They landed in the same place, but what did you notice about the turn? Me: They turned in different...what? Me: Did one slide and the other jump? Or was it more like they turned in different directions? Me: Did you see that pattern, you almost couldn't tell it was reflected? It was SNEAKY! And you didn't really know until the end! Give them some applause for the sneaky-ness! Me: Now, who wants to play "Whoooooo's the reflection?!" Kid: When they did the cross T. did the opposite way. Me, to class: Any other ways to describe how T. was different? Other kid: When D. turned to the right, I think, T. turned to his left. Me: So who do you think the reflection is? Me...so, why do you think it was S? What did you see or what did you notice about what he did? Kid: When M. turned he faced that way and went to that corner and S went to that corner. Me: So, they went to opposite corners. Me; Okay. Who changed the pattern? Me: And why do you think it was G.? Another kid: Grant changed his body while A changed his body the other way so the bodies were the opposite. Me: But how did you know it was G. specifically? Third Kid: Because, for the last time I was glad you said it was the last time they would do it congruently because I didn't get to look at their diagonals. So, their diagonals...A's was a right diagonal I think, and G did a right diagonal. Me: How many people noticed his first jump? Me: Who do you think the reflection was? Kid: H. because N turned the right direction and when H. saw that he turned the left direction. Me: How many people agree (hands). Was there any other information? Kid: In the beginning it was, when they did it congruently, it was right diagonal, left diagonal? And then H. went left diagonal, right diagonal. Me: Who wants to give me a reason for why? Kid 2: I think it was H. because on the second beat her feet went...when they did it congruently I memorized their feet positions and which corner their feet went and then I was watching that corner when they did the other one then that person would be the reflection. Two girls in the process of reflecting their math/dance pattern. Different year, different school, different kids. Same tape. Today I took the noticing and wondering of my 4th graders from yesterday and used that information to restructure the frequently stressful last two days of my five day residency. I will be going into more detail about how N/W has impacted my teaching after I finish the week. Today, however, it was clear that all three classes were noticing the math in their math/dance making more and more specifically. 1. Students practiced/reviewed their A & B patterns. 2. 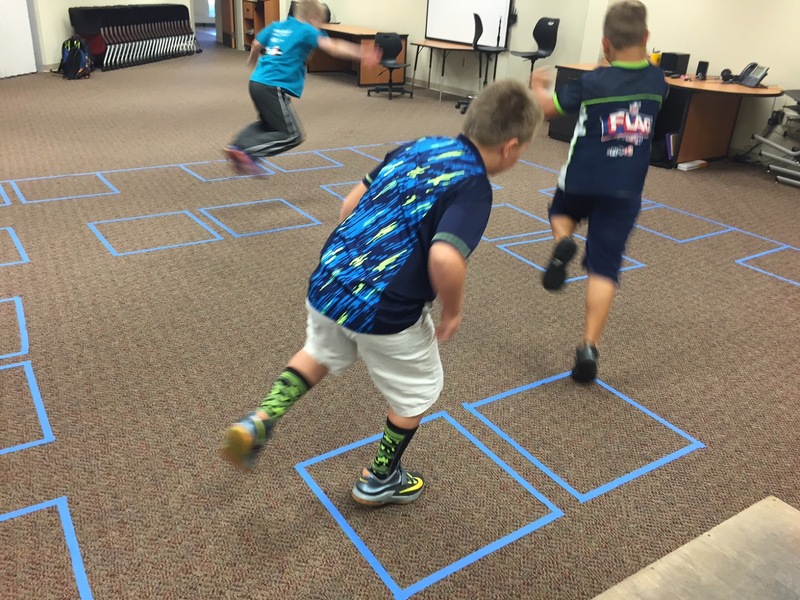 A body-based lesson on reflection symmetry and how to apply that idea to their foot-based dance patterns. This included more discussion about how we were evaluating sameness. 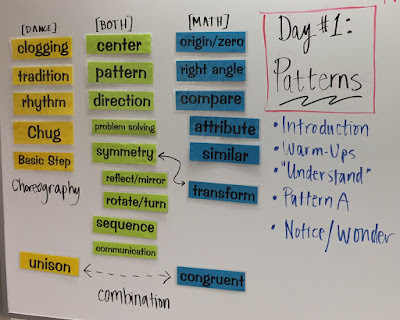 The classroom teachers have moved their geometry unit to this week so they can make specific connections to the MiYF work. I checked in with each class and asked them if we could use the word congruent to describe how they dance their patterns exactly the same as their partner. One boy said that our dances couldn't be congruent because all the 4th graders are different sizes. This led to a discussion about the relevant properties with which we assess sameness/congruence (all properties the same). FANTASTIC. 3. A chance to combine their A & B patterns into a new 8-beat pattern, otherwise known as unitizing. All you have to do is read their notices below and you'll see how cool this is. Doing the reflection was pretty easy because it was like just doing the opposite foot. His foot was on the outside [away from the line of reflection] and I used my outside foot too. The whole mirror thing was kind of tricky. I had to do the complete opposite. When you were doing the reflection not everybody was doing the exact same but they were pretty similar. That you have to take away one beat to make it Pattern C...[did you take away one beat or did you take away your starting position?] Starting position. When we did B+B it was very hard because we kept getting confused with our moves and what to do because of our 180 turn. We were used to starting our pattern facing backward, and it was confusing doing the pattern [again] facing forward. It's harder when you do same pattern twice, like A+A together because I finish over HERE and I have to jump to over HERE. It was freaky to put A+A together. When we did [our pattern] forward and then we turned and tried to do it the other way it was harder. We were facing this way the whole time and then when we tried to start from the other side and look this [other] way it was harder. When we were doing it congruently I noticed they [a nearby team] has a similar pattern. We did really good even though it was difficult. That everyone did Pattern A better than B...because we knew A better. Heading into our final day I am finally seeing the process of math/dance making from the inside of the process. There is so much to notice from the outside in observing children's bodies thinking, moving and learning all at the same time. But having Notice & Wonder this week has taken my understanding of their learning to a whole new level. Kids practicing their math/dance patterns on my dance board before we started class this morning. The room was hot all day. The kids were overly concerned about things being fair in terms of who got to show their work. They were also a bit squirrel-y (and my focus could have been better) but we all worked hard on the process of creating a second 4-beat pattern, Pattern B. Compared to other days, this day was a huge challenge (in a good way). I have always known that Pattern B is challenging, even without hearing what the kids noticed. But their notices were so full of details today, way more than the first few days, about the process of making a new pattern as different as possible from their first pattern. I'm still pondering what to do with these noticings. It's already a great tool for assessing what and how they're thinking about the material. But I keep thinking there has to be something specific I can *do* with this information. And then I think that maybe that the explicit process of reflecting like this is helpful in itself for my learners, but I can't quite put my finger on why that might be exactly. So, for now, I will be content with what I have and look forward to the final two days of this residency. In case you're interested, my original wonderings/goals re: adding Notice/Wonder to how I facilitate Math in Your Feet can be found here. - We had to do two patterns so people had to know Pattern A and Pattern B and it's confusing...they have to know which one. - [Me and my partner] would share our ideas and then we would do them all and then figure out which one was the easiest and the one we could do all together. - It was hard because of the turns [So you gave your self a challenging pattern?] Yep. - The first time I did it wrong and the second time I did it right. - It's hard to do the same thing as your partner. - We got confused a lot and we stepped on teach others feet and we got confused. [Why?] Because we kept on changing it and sometimes we'd remember A and mess up Pattern B. - It doesn't take long to decide on a Pattern B if you talk and give ideas out to your partner. - We had to change our Pattern B because our first one was too hard. [What made it hard for you?] We did all this tricky stuff and turned around a lot and crossed our feet a lot and it got hard so we changed it. - People were making mistakes which is a good thing because if you make a mistake it's a FAIL which is a "first attempt in learning. - I wonder what the rules are for [making] Pattern C? - If every partner can agree with the other partner. [So, were you noticing that you were having some difficulties?] Ummm...a little. [Did you guys come up with a Pattern B?] Yeah. - If everybody's A and B patterns will go good together? 1. 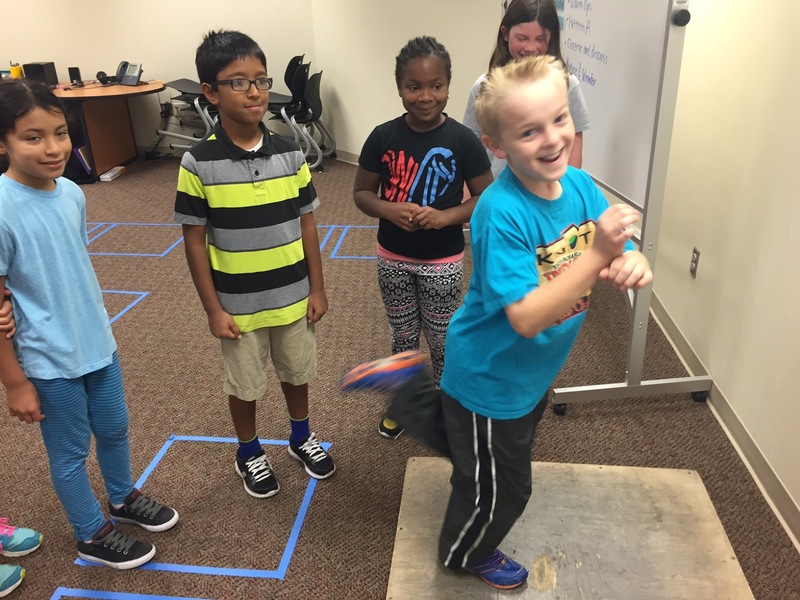 I'm engaged in a week-long experiment with Notice & Wonder as a way to help kids in Math in Your Feet reflect on their body based learning and experiences. My Day One post is here if you want to get a sense of what my goals and wonders are. 2. 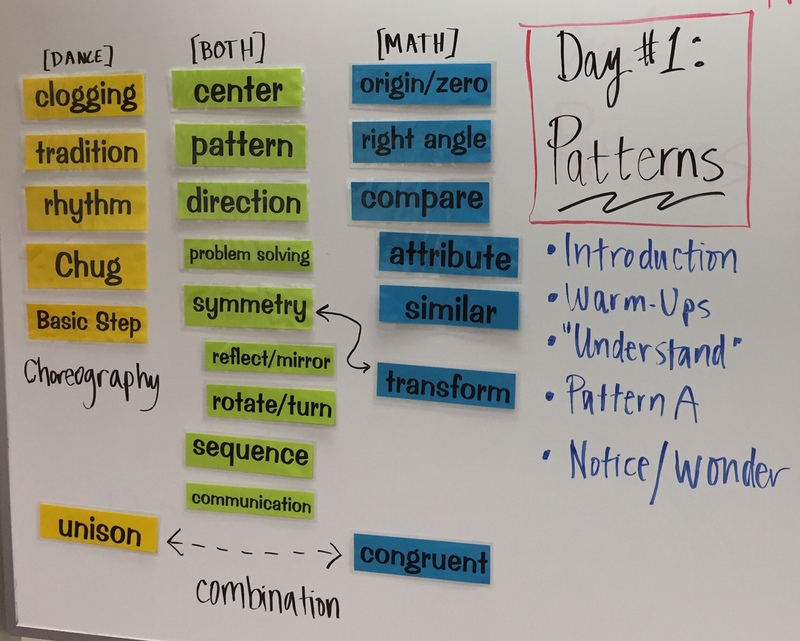 For Day 2 I added a Notice into our observation of the math/dance patterns in progress, which led to increased student engagement and pattern analysis. 3. Make sure to read the Notices and Wonders at the end of this post. They are lovely and philosophical and insightful as to the creative process. They are also interesting evidence of children's processing around turns, degrees of turns, and combinations of turns. Why hello Trigonometry! Today we started making a four-beat Pattern A. 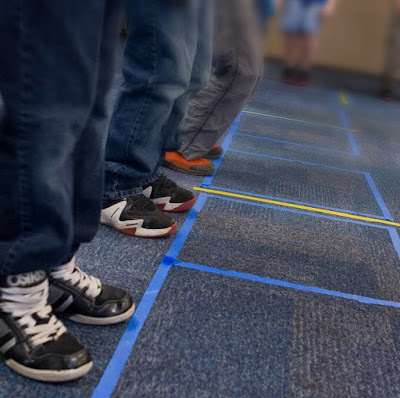 As part of this process I initiated a conversation to help kids focus more closely on the categories of foot position, movement and direction as resources for our pattern building and for noticing the structure of these temporal, moving patterns. Working on Pattern A also requires an emphasis on "sameness" -- making sure both dancers are dancing the same pattern and dancing it the same way. Instead of directly guiding conversation by asking "What kind of movement (or direction, or foot position) did they use in that pattern...?" I decided (on a whim, let it be known!) a Notice. After a team of dancers would show us their pattern I would first ask something like: "What did you notice about their pattern?" For the most part, children in all three classes noticed at least one relevant attribute without me prompting. And, even better, these initial noticings started interesting conversations during which I could contribute/introduce new ideas or observations and deepen the conversations. The kids were more engaged in these discussions than I've seen before. Ever. Since I only have five days max with any one class, I never have enough time to really figure out exactly what makes each group tick. Imagine having the first week of school over, and over, and over again. But, with the Notice/Wonder (first done in conversation with a friend and then shared out to the whole group) I am getting much more information from these 4th graders about how they're thinking about their work than I ever did before. Here are their Notice & Wonders from Day 2, but not all of them. I've combined all three classes' responses -- some of them were repeated in each class. Refresher: today's mathematical themes were sameness, problem solving, categories, and identifying attributes/properties as a way to make sense of pattern and structure. - It was hard for us to go at the same rate. 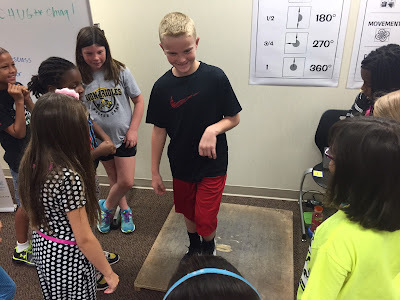 - Can I clog at home? - If you could change a 360 degree turn into 314 degrees or you could choose your number from zero all the way up to 360? - Why your body and your mind control the pace you go in...why only you can control your pace. - How we come up with the things (pattern) we came up with. [Do you have any thoughts about that?] Well I think it's about how much you're creative and how much you do that thing. Like if you like to turn and that's your favorite thing and you do it all the time you probably would like to add that in to your pattern. Bonus: 4th grade Teacher Wonder! ...What it would be like to make a math problem out of our turns...if we were adding and subtracting the angles as we turned, what the extent of that math problem would look like. Today was my second of five days with three classes of 4th graders. Today Mr. C, whose class needs to be with me at 9am, smoothed out his morning routine and told them to come straight to the LGI room. Kids trickled in from buses, drop-off, breakfast, etc. In the absence of any particular activity the kids immediately started exploring the empty space. The activity mostly consisted of jumping from box to box and eventually led to discussion about which leap was the furthest and most difficult. I am a big fan of self-initiated explorations of space like this but after a while there were too many kids in the room to do this safely. Luckily one kid wanted to try out my dance board which led to a wonderful round robin of dancers, all being cheered on by their friends. So cute! If you change a familiar space with tape kids will notice. 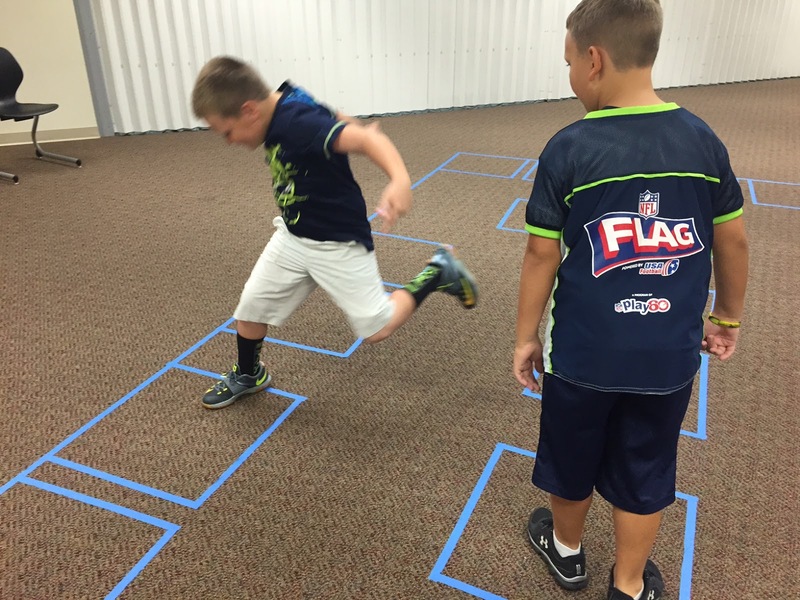 When they notice they will explore this new structure with their bodies through movement. When they explore you will see how they are thinking. In this case their exploration was spatial and also mathematical in terms of magnitude and direction. I've noticed (ha ha!) over the last year or so the ways that math teachers have utilized the Notice and Wonder structure in helping kids problem solve and make sense of math. I've been wondering how N/W might play out in terms of helping kids make sense of their experience learning math and dance at the same time in Math in Your Feet. Buoyed by a conversation with Suzanne Alejandre from the Math Forum I've been thinking more closely about how Notice and Wonder might be used to help my learners become more personally invested in reflecting on their math/dance making experience. 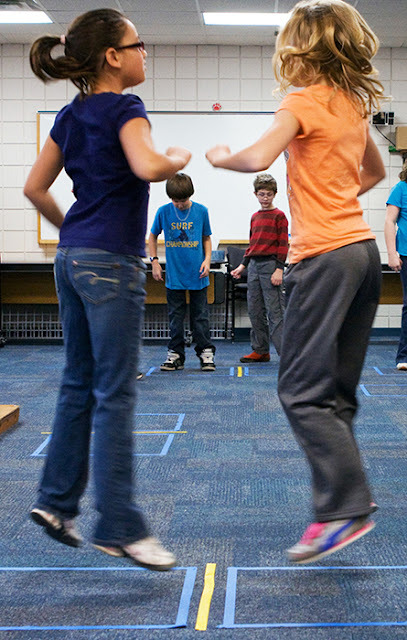 In general, kids are already invested in the dance work, but I have always wanted them to make more connections between what they're doing and what they think about what they're doing with both the math and the dance. This week I'm doing my first school residency of the school year. I'll be at this particular school for two weeks, working with three 4th grade classes one week, the remaining three 4th grade classes next week. Today I did Notice/Wonder with each of my three classes. I had them first talk with their partner about what they noticed and then share out to the group. I did the same thing with the wonder. I will likely keep this procedure the same each day. - How or will their noticing and wondering change over the five days we have together? Meaning, will they get better at it? Will they notice different things every day? - How/will will Notice/Wonder implemented verbally/socially in my class impact their written reflection and word studies in their #miyfeet journals back in their regular classrooms? - What will I learn about their thinking and how might that inform the way I facilitate their math/dance making & learning? For context, today we started with learning what it feels like to make rhythm and patterns in our feet. The math connections were patterns and how we can make new rules to create variation, a lot of body-based spatial reasoning, language like center/zero/origin, and also some physical exploration of 90 and 180 degree turns in the context of the dancing. For this reason, a lot of their N/W was about the dancing. ...It doesn't always have to be your feet your feet [that move], it can be your body too. You can twist your body around and your feet stay in the same place. ...I noticed that we made some mistakes and I, personally, stopped because I didn't understand it and I watched to see how it was done. [Me: was that helpful for you?] Yeah. ...how do you do this for so long and not be tired? I'm thrilled. This is already SO much more information about how the kids are experiencing the work than I ever had before. In my work I provide educators an experience of actually doing Math in Your Feet. I believe that as teachers we need chances to move out of our comfort zones and have experiences with new things, as learners. In my workshops teachers experience familiar elementary math in a brand new context. We need to reflect on that. 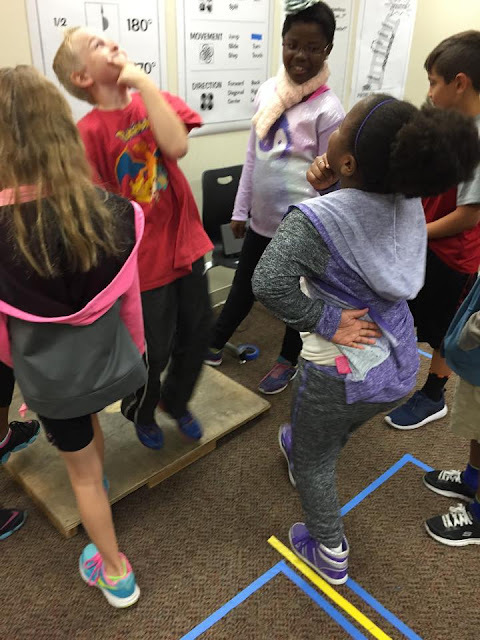 We also need to reflect on my approach facilitating the math/dance making which includes the flow of the lessons and how they build on one another, the conversations, the focus on language, and facilitating student collaborations in a moving classroom. Because this is often new territory for teachers, I need and want make sure there is enough time for them to think about how they might approach using Math in Your Feet in their own classrooms. I want this reflection to be meaningful and useful. Currently, I provide opportunities during my sessions for teachers to reflect on what the math/dance making they've been doing and what they notice about that learning. The reflection times are partly an adaptation of the Notice/Wonder approach which comes out of the Math Forum as a tool for helping students make sense of math. It is very similar to Descriptive Review, an arts education protocol introduced to me by my Teaching Artist Journal Colleagues. Overall, I am quite comfortable facilitating noticings and wonderings but...then what? What happens next? Neither myself nor my participants have been satisfied with me trying to quickly answer all their questions at the end of a long day. ...an approach to experiential educator professional learning that helps participants not just learn "how to do" something new, but supports them in extending their questions into answers that will work for them in their own classrooms. Unfortunately, organizations who bring me in are generally only willing to hire me for a day. Right now I see no possibility for developing longer-term coaching relationships. I would greatly appreciate your thoughts and feedback! Full-Day Educator Workshop in Michigan! This just in! 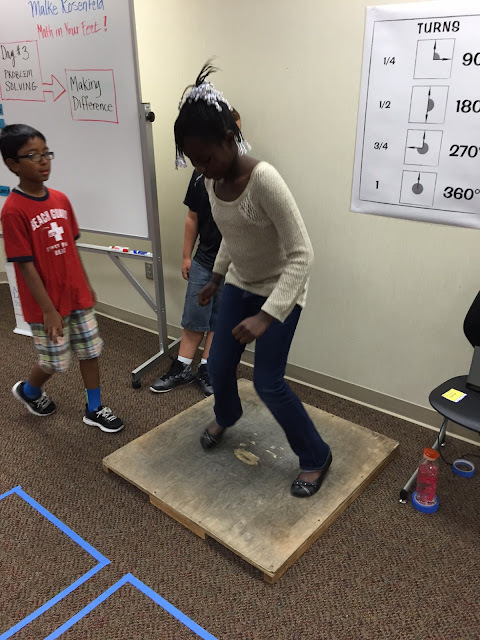 I will be teaching a day-long Math in Your Feet workshop at Grand Valley State University, Allendale Campus in Michigan on Wednesday, October 14, 2015. More info HERE. Hope to see you THERE! !